It isn’t always practical–or possible to bring along your child’s car seat or safety booster when traveling. But there are safer alternatives than traveling without the car seat at all. Here are the best car seat alternatives available for travel by taxi or car, and also by airplane. With the Ride Safer Vest your child can travel safely without a car seat or booster from 3 years and 30 lbs. Think of it as a “wearable belt-positioning booster seat” you can pack in the outside pocket of your carry-on. After your flight, have your child put it on outside baggage claim while you wait in line for your taxi. She can wear it like a normal vest, or add the optional crotch strap for the safety of a 5-point harness–something you won’t get from a regular booster, and the comfy removable head rest. Like booster seats, however, it is not approved for use in aircraft. A removable head rest offers extra comfort when desired. Weighs 2.5 lbs. without head rest or optional tether, under 5 lbs. with it. The RideSafer 2 Delight Travel Vest meets or exceeds all crash test requirements and Federal Motor Vehicle Safety Standards for harness restraints (FMVSS213) model. 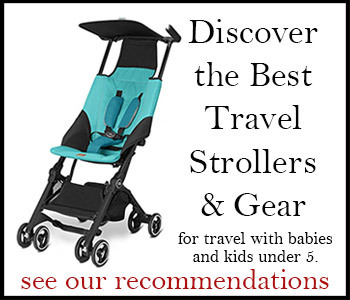 * Find out more: Read the Travels with Baby feature review of the RideSafer Vest for more details and photos. Turns the airplane seat belt into a 4-point harness for children over 1 year old and weighing 22 lbs. to 44 lbs. CARES (Child Aviation Restraint System) is ideal when children will be flying in their own airplane seats, but won’t need their own car seat at the destination, as when you’ll be renting a car seat at your destination or using another car seat alternative for your ground transportation. For very light travels, consider pairing the CARES with the RideSafer Vest for car seat alternatives in motor vehicles. CARES is FAA-approved for use during all phases of a flight, including taxiing, take-off, and landing. First adjust the straps to fit around the airplane seat, then use the harness to secure your child to both the seat back and airplane seatbelt. Please note that CARES is approved for use in aircraft, but not in automobiles. If you’re bringing along your car seat, but don’t want to use it on the aircraft, I recommend you always gate-check your car seat rather than subject it to possible damage–which may or may not be visible–from the airport baggage system, or use one of the other car seat alternatives for your ground transportation. CARES weighs only 1 lb. and packs into a 6″ stuff sack. Find out more: Read the Travels with Baby feature review of CARES with more photos and tips. Saves your back and arms while allowing interaction between you and your baby. And unlike most airline bassinets, which must be used on the bulkhead, you can use the FlyeBaby on rows offering more peace and privacy. The soft “sling-like” hammock features a 3-point harness. It attaches to the tray in front of you and your airplane safety belt, and stores in a small pouch that fits easily in a corner of your diaper bag. Note that the FlyeBaby is not considered a safety product and is not FAA-approved for use during take-off or landing. It was, however, featured in the SkyMall Inventor’s Corner and is widely accepted for use on airplanes during cruising portions of flights. That’s a picture of us using it above. If you’re interested in the FlyeBaby, be sure to see the Travels with Baby Feature Review of the FlyeBaby Air Travel Hammock. Turbulence is by far the leading cause of injuries in flight. And no one on board seems quite so vulnerable to injuries from turbulence than the little lightweight people riding as “lap children.” This handy little vest slips over your lap child and attaches to your safety belt with a loop, therefore securing babies and toddlers against unexpected bumps. Made of soft 100% cotton and fully adjustable side and crotch straps. Allows for shifting around as needed, even for breastfeeding. The Baby B’air is permitted for use in-flight by the FAA as noted on its tag, though not for taxiing, take-off, or landing. It slips into the side of your diaper bag or carryon with ease. Available in two sizes: Infant, recommended for newborns up to 8 months, and Toddler for up to 2 years.